Having worked in the top media companies, what inspired you to venture into liquor industry? I was born and brought up in the UK, and after university I specialized in International Marketing and consumer behaviour and felt marketing management was the right field for me in the UK. However, I have long been inspired by the liquor industry. Being exposed to Double Dutch, a beer brand that my father launched in the UK 15 years ago, I noticed that products in the price sensitive bracket in India were of very low quality standard and good quality products were extremely expensive. In the liquor industry, I found a very specific gap in the market. The premium liquor segment in India’s mass market was completely under-utilized. This is when I envisioned building a liquor business in this country that provided the market with value for money products. You started I Brands in 2010. How has been the journey so far? Today, I Brands Beverages is an award winning company and one of the fastest growing liquor startup companies in India. We have 4 fantastic products in our portfolio - a premium whisky brand - Three Royals (MRP: INR 350 – 735 for 750 ml), a deluxe whisky brand – Granton (MRP: 230 – 495 for 750 ml), which has recently been awarded for its packaging at the INDSpirit 2014 Awards, Jamaican flavored dark rum - Rum 99 (MRP: 210 -330 for 750 ml) as well as a rare French brandy – Granton XO Brandy (MRP: 280 for 750 ml). We have won four awards both from the industry and nationally, that too in our fourth year of operations, which is a huge appreciation for the hard work my team and I have put in. In our fourth year of operation, we are present in Punjab, Haryana, Chandigarh, Assam, Arunachal Pradesh and Uttarakhand in the North and Goa and Pondicherry in South India and across 5000 point of sales. We have just received our first paramilitary orders as well. Our products have been gaining noticeable market acceptance and Granton Whisky, our flagship product has been flying off shelves. What were the initial challenges you faced in starting a liquor business? We faced a lot of challenges initially. The biggest challenge was perhaps that the liquor industry was a financial intensive industry, and at the point I didn’t have the kind of funds to play with. That is the norm of the industry. Also, being an unknown company, we had a hard time getting distributors to work with us. Regulations in each state is also very different from the other in terms of excise duties, tastes, language liquor preferences, licenses required etc., which makes this business incredibly challenging. Today, there has been a phenomenal response to I Brands’ products across the country, and it is the popularity and quality of the products that have allowed the company to not only sustain itself in this incredibly tough and complex industry, up against some massive players but has also double turnover in just 3 years, surpassing the million dollar mark! 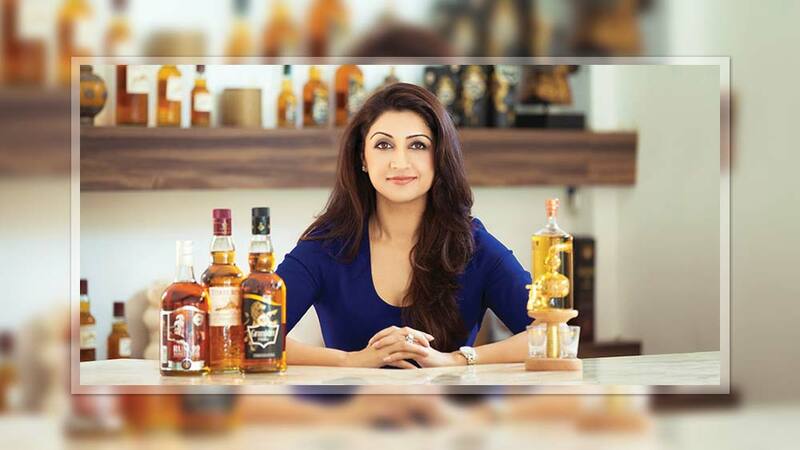 Alcohol industry is considered as one of the most criticised industries in the world, so being a woman, did you face any kind of criticism from the society? There will always be people who are anti-liquor, but this industry is just like any other industry and obviously a lucrative industry. You can understand this from the number of foreign players consolidating this market. Alcohol is no longer taboo. And according to me prohibition doesn’t work. One should be able to have the choice whether to drink or not. This industry is now no longer controlled by the thekawalas. It is constantly evolving and is moving towards FMCG which means we can provide consumers who wish to drink, the best choice in good quality products. The liquor industry in India is estimated around $9 billion. What are the opportunities and challenges do you see in this industry? The liquor industry is a very capital intensive industry and it takes longer to break even. Most liquor start ups have been known to shut shop with the first six months of operations. Also, it is very male dominated – for a woman to find feet in this industry or making a mark, it is extremely difficult. Additionally every state in India is like a different country with different excise policies, labelling laws, tastes, palates etc. There is a big opportunity here for the government to create the conditions to do business in India much easier. A uniform, harmonised state excise policy and simplified labelling regulations would help grow revenues, lessen complexity in the trading environment and make it easier for the authorities to reduce illicit alcohol production. We see that lots of innovation is happening in the beverages segment but not in alcohols. What is your comment? Can we see innovations happening in the segment? In the alcohol industry, there is not much that you can do with the dark spirits, especially because of the traditional drinking habits. We know this from research that if you tend to experiment with these drinks, they might not necessarily work in the mass market premium segment that all our brands are positioned in – Our consumers prefer certain drinks a certain way. The only way you could innovate and customise is in the form of packaging. In the industry there are various forms of packaging – Open cased, Mono Cartons, Canisters etc. that provides innovation. And we at I Brands Beverages have always been at the forefront using the latest technology and designing to our advantage. Be it Guala Caps for the bottles or our award winning canister packaging which was the first in its segment. Embossed bottles give our consumers the feel of affordable, yet luxury products. Our company has always tried to give a superior offering to the consumer. From where did you manage the investments? Have you raised any funds or are you planning for the same? Col. Mahinder Singh Khaira, a property developer in Bangalore is the chief investor at I Brands Beverages Ltd.
Having set a solid base foundation for I Brands Beverages, we are driving the business forward ambitiously. We are currently looking at strategic partners to consolidate our business, driving our sales upwards. It is the right time for institutional funding and linking with strategic partners who see the potential in the $ 9 billion industry growing at 10% p.a. With 450 million people of drinking age and another 150 million joining in the next five years, it is a highly lucrative industry with few pan-India players. Now more than ever is the right time for us to gain further distribution as we now possess a grand portfolio of products and our company is winning Best Start-up in an overcrowded liquor industry. At this moment, plans are afoot to open up new markets. We plan to launch in Delhi, Rajasthan, Tripura and Maharashtra. We are also looking at launching in Karnataka, Andhra Pradesh, Telangana, West Bengal and Andaman & Nicobar Islands in the next couple of years. Gaining pan India presence is the plan of action at the moment. We are working towards a pan India presence in the next 5 years. Talks are also on for developing our own bottling unit in the east and in Punjab. I envision taking I Brands Beverages to being one of India’s top 5 liquor companies in the near foreseeable future! Running a Preschool is No Child's Play..
How India bakes in 2015?..